I’m so excited to share what I found with you! I actually bought it 2 weekends ago, so the excitement’s been brewing for over a week now. Seriously, I think what I’m about to show you is one of my best thrift store finds ever! 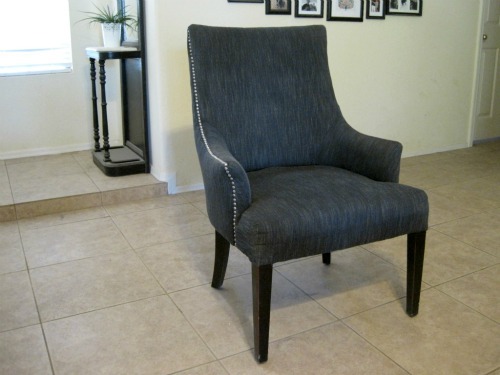 A nailhead trim chair (like new) for only $26! Originally marked $65 (still a good deal), Salvation Army was having a 60% off sale, so I only paid $26! I didn’t want to risk someone else snatching it, so I carried it straight to the register and loaded it in my car before anyone could blink. I’ve seen similar chairs for sale at HomeGoods and Joss and Main for $199, and those don’t always have the nailhead trim. Can you tell I’m still excited?! We’ve needed extra seating in the living room for awhile now, so it was a great find. It’s actually really comfortable too. We’ve been using it a lot over the past week and no complaints. OK, so now I want to hear about your best finds. What’s on your “best ever thrift finds” list? Waaaaaaaahaaaaaat! $26.00?? Are you serious! That is awesome! And it's cute! Wow! I loveee ittttt! 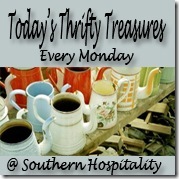 I thought my $6.00 brass vintage lamp was sweet but this..
is the winner of the thrift hunt! PS I was looking at your gallery wall in the background. I think it'd be totally cute if you found like a midcentury modern kinda dresser (and painted it white but left the drawers wood) and put it under there like a console table! Or something like that... mostly I want a console table but my house is itty bitty. So I'm trying to live vicariously through you! lol. I still want that chair! I am totally jealous! Can't believe the price you snagged it for :) I love it! That is a fabulous deal!!! WOW! That's a gorgeous chair at any price, but the amazing bargain makes it even better looking. I think my best thrift find was the $25 very nice fake Christmas tree at Goodwill. I didn't think I'd be able to afford one but thanks to that bargain, I had a real Christmas in my first home after all. I don't thrift much, but I was just telling my niece we should look for a dresser for her room soon. One find for me was a pair of like new Gap cargo pants for $2. They were my size, but I didn't realize they were longs. So I started scoping out my friends at school, and I went to one and asked her if she wanted the pants. She wears them all the time and she loves them. So I get to see my great buy on my friend who loves great in my two dollar find!